Write it all down – First things first is that you’re going to at least need somewhere where you can easily write things down into for future reference. This might be the notes on your phone for a quick and on the go method or a notebook if you’d rather put pen to paper. Writing things down helps you to clear everything out of your mind and deposit it somewhere else without running the risk of forgetting. You can store any ideas for future posts, important dates for events or meetings you might have in the pipeline, create a to do list to keep you going, store any key details of brand collaborations or sponsored posts etc. Purchase some cute stationary – Nothing says organisation than buying some cute stationary pieces to work with! Treat yourself to a cute notebook, desk planner, some fancy pens or pencils, some sticky notes and whatever else you think will help you or you fall in love with. Create a calendar and work to a schedule – If you really want to be extra organised, then working to a content schedule might be ideal for you. Creating an editorial calendar will help you with keeping to your schedule. An editorial calendar gives you the opportunity to control the process of creating your content, right from the start of thinking of the idea up until you hit that publish button. I have an 18 month planner to help me keep organised with mine. I pencil in the posts I want to publish for that month on the days I upload on and always refer back to it when I want to look what posts I am going to be publishing for the next couple of weeks. The great thing about pencilling in these posts is that you can always switch things around if there’s any problems with posting or if you lose passion for a particular post you may have scheduled. Another option you might decide to go for instead of a planner is working to a spreadsheet. This is great if you prefer working straight from your computer instead of physically writing things out. You can really personalise your own calendar this way to suit your needs and style, as well as correcting and changing things up with a few clicks of a button. Plan plan plan! – Planning is super important. It gives you a clear idea of what it is you need to do to produce the post(s) such as what photos you want to take, what you want to write about, the benefits of this post to your readers, is there anything you to need in order to to actually produce the post, like photo props or any products? This will help you to avoid sitting at your computer screen stumped with time wasted. Make to do lists – I couldn’t work properly without making to do lists! They’re so handy for not only keeping you organised, but also help with keeping you focused and motivated. Remember to set yourself realistic goals for the day ahead, especially if you have quite a busy schedule anyway and you blog during your spare time. It also is good to write out your list the night before, so you know exactly what is it you need to do and can get straight on with it. Plus there’s something so satisfying about ticking something off on your to do list, no matter how big or small. It’s an achievement. Set yourself reminders – If you know that you’re someone who’s quite forgetful or finds it hard to manage their time, then setting yourself reminds might be a great option for you. You could do this by setting yourself reminders or alarms on your phone or sticking little notes around the home to remind you of what it is you need to do. This can also help with if you’re feeling overwhelmed by the amount you have to do. 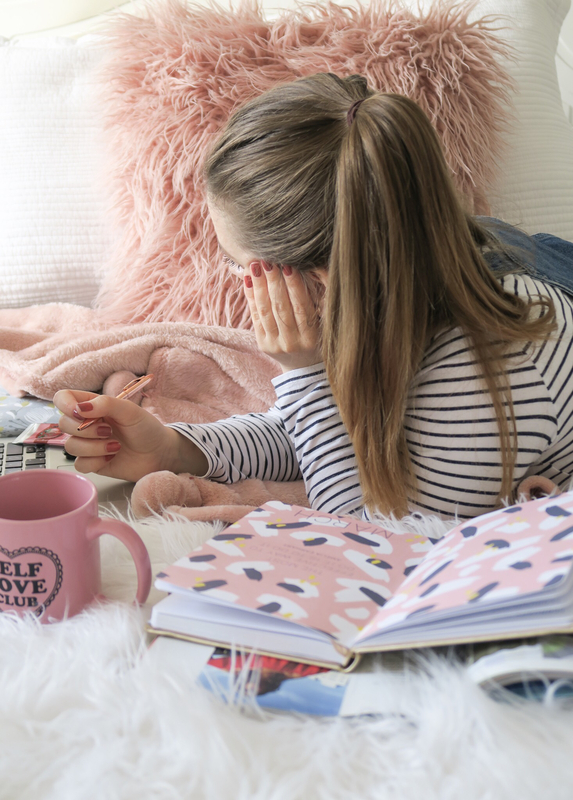 Dedicate a time/day to blogging – We all know how hard it can be to blog with the ongoings of everyday life, so setting yourself a certain time or day throughout the week to blog will really help you to stay organised with your blog. You might decide to keep a few evenings a week to writing up your posts and scheduling promo tweets, whilst keeping your sundays for photography sessions and content planning. Find what works for you and keep at it. Respond to emails on the same day you receive them – I’m quite guilty at not doing this. But it’s definitely something I’m going to try work on, especially when it comes to responding back to important messages from brands and other bloggers. Responding to emails on the same day will not only show your interested, but also will mean your inbox doesn’t end up piling up along with that to do list of yours. Quality over quantity – Blogging is different for everyone. Some people will post more than others and some will post less over a week. Either is absolutely fine and it’s important you do what works best for you. This is where quality over quantity comes in. Don’t feel like you need to post just for the sake of posting. Don’t. This might be where the quality of your posts end up slumping and where you end up becoming overwhelmed by trying to keep consistent with your high quantity. It might be easier for you to manage a smaller amount of posts each week and keep organised with this process, than it is to keep pushing out posts that aren’t to your usual standard and end up falling out of love with it all. Treat it like work but have fun – Sometimes blogging can end up being more of a chore than a hobby when you find yourself lacking inspiration or you end up slipping behind. This is where being organised comes into play. If you’re organised and treat it kind of like your working a job with lists, a schedule and plans, you can keep things running smoothly. But add the fun element into it by putting the things you love and doing things you enjoy into the mix. This might be taking photographs, writing about subjects you’re passionate about, getting creative with your content or being a social bee on your social media pages. Maximise time – We’ve touched on schedules and everyday life. If you’re someone who doesn’t have much time to spend blogging, then maximising any free time you do have is super important. A good idea would be to dedicate a time or day to work on your blog as also mentioned above. But any other moments you find yourself bored or unsure of what to do, then put this time to use and work on your blog. This might be on your commute to or from work or school, when you first wake up in the morning and your scrolling through social media for ten minutes or so, when your partners out for the night and you’re home alone or on your lunch break, spend a few minutes scheduling tweets, responding to emails or comments on your blog, uploading a new picture to Instagram or catching up with people on social media. Find a work space – At night after a long hard working day, you might find it hard to switch off from the world from your computer or phone screen. We’re all guilty of doing this. But shutting these things down and leaving them be for the rest of the night is so important for our overall health and wellbeing, but also for keeping ourselves organised and putting that side of our lives to rest the night whilst we also drift off. Pick somewhere around your home, whether thats an office/study, a chair in your living room or a desk in your bedroom, that you can use as your work space and once it’s time to wind down for the night, then leave it be and come back to it in the morning. How do you try to be an organised blogger?